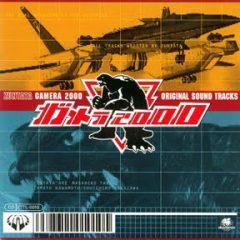 One could hardly blame you for scoffing at this game simply by virtue of the license… while Gamera may have his fans among the kaiju crowd, he is definitely one of the sillier designs that have come from that genre of films. Add in the fact that it’s a licensed game… on the PlayStation… and well, let’s just say the odds were not in favor or this being a quality purchase. Imagine my surprise, then, when my (kaiju fanatic) friend told me of this obscure little import-only gem, and that it’s not just a good game, but it skirts dangerously close to the edge of being a great game. The gameplay can be summed up in two words: Panzer Dragoon. Pure and simple. With one exception, you are in control of a jet which flies through the air, and you use the L1 and R1 buttons to shift your viewpoint through quadrants… forward, left, right and backward. Tapping the fire button sends a rapidfire burst of energy at your target. And that’s largely it. Don’t you just hate giant two-headed lizards in your bay? It is at this point that I shamedfacedly admit my earlier oversight, and tell you that you do not undertake your missions alone… You have a wingman, of sorts. 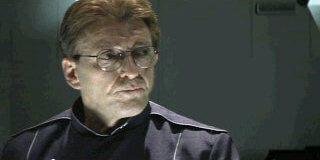 Indeed, it is nothing less than Gamera himself who flies on your wing in a support role. 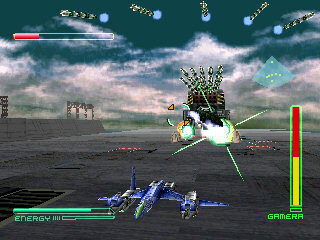 By holding the fire button, your targeting reticle shifts and you can then lock onto multiple targets, in a fashion identical to that of the Panzer Dragoon games. When you release the button, your plane does… nothing. …Okay, I’m being disingenuous. When you release the button, Gamera kicks into gear, launching a batch of fireballs (in the number of how many lockons you had) which home in and damage your foes. In actual use, not very different from PD’s homing lasers, but it certainly is a lot funnier to behold. Each launch also comes with the signature Gamera roar, straight from the movies. Also, there is a special attack button, which must be held down for a duration while Gamera begins charging up. During this time, the giant sea turtle retracts all his limbs and begins spinning like a dervish, small streams of energy coming from the holes in his shell where his flippers and legs… err, thrusters… used to be. If you’ve never seen a Gamera film, I swear I’m not making this up. 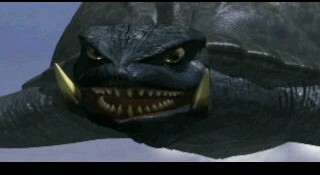 When you release the button, Gamera flies into a fury, still spinning, careening off of every enemy in sight multiple times. The longer you hold the button to charge, the longer this special attack lasts. 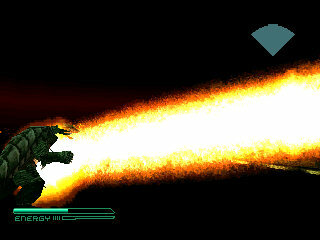 And obviously, when you’re charging and releasing this attack, you have only your rapidfire energy weapon, as Gamera’s too busy spinning to launch homing fireballs. 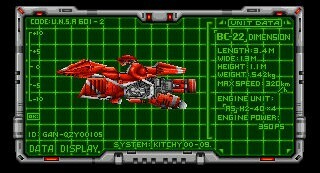 Why yes, those are missiles. That is essentially the core gameplay of the title, which would be enough on its own to merit checking out, if not an eBay hunt. Fortunately, there is a considerable wealth of entertainment to be had in this title, well beyond the shooting/spinning/colliding action. 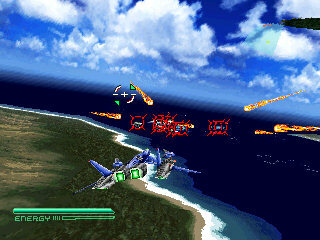 The game’s storyline is told by way of a very Wing Commander-style interface, and you can expect to see plenty of well-done cinemas (relatively speaking) along the way, which are completely, 100% in English. 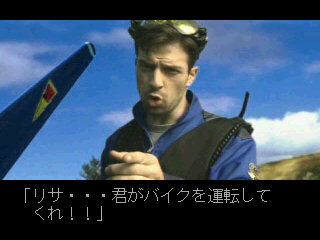 All of the menus and ingame text are in English, too. 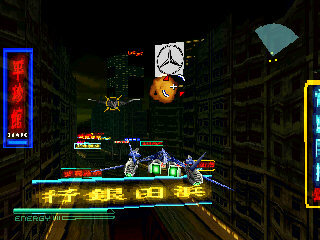 Indeed, aside from the relative obscurity of the license, this is one of the most import-friendly games ever made. You are likely to wear both of these expressions when playing. Possibly simultaneously. Indeed, live-action cinemas. But when you see them, you will immediately come to love this game as a perennial favorite, to take out and show your friends. For these cinemas are among the funniest things ever created by man, god or beast. The acting is so over the top that it’s laugh-out-loud funny, and more quotable than you can even imagine. They must be seen and heard to be believed. I won’t spoil the classic delivery, though; let’s just say that Tom Servo and Croooow! would have a field day. And from a technical standpoint, they actually look pretty good, as they were shot in a fashion similar to Wing Commander III, on greenscreen with CG backgrounds. This guy’s just as obnoxious as he looks. 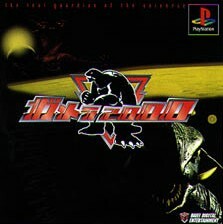 Getting back to the gameplay, Gamera 2000 impresses with a decent variety of missions for a shooter. 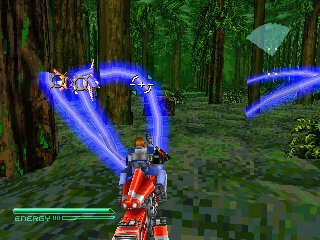 One stage of particular note, in an obvious nod to Return of the Jedi has your characters riding a hoverbike through a forest while being chased by all manner of creatures. 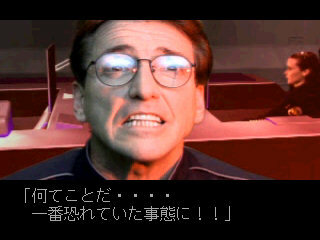 In this stage, Gamera is not with you, so your copilot is the one doing the shooting with a one-handed laser gun. 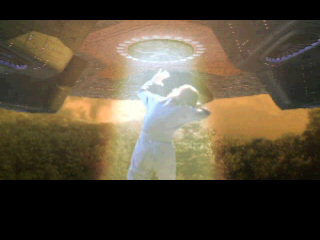 Locking on in this stage actually does produce the much-vaunted homing lasers. 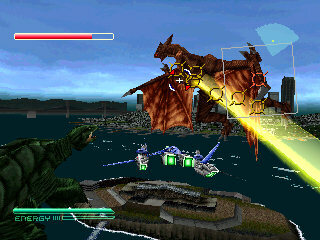 Another has you fighting Neo Gyaos, which is a variant of Gyaos, one of Gamera’s perennial film foes, as it emerges in the middle of San Francisco Bay. Of course, as this is only a PlayStation title, the graphics don’t really convey the level of scale as well as they might, but it still looks good. 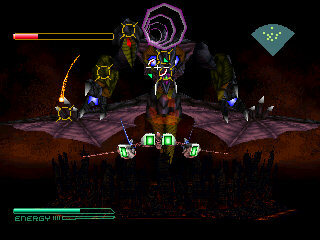 Speaking of which, the boss battles in this game are pretty intense. They typically tend to be much larger than you and your reptilian wing-turtle put together, with dozens of possible lockon targets. One of the final bosses is nearly the size of Manhattan Island. 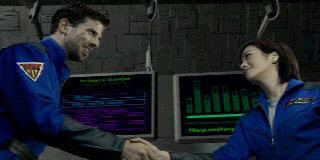 You can cut the sexual tension with a spork. The difficulty in the game is also extremely well-balanced. Easy mode is pretty much a walk through the park, while Normal provides a solid challenge, and Hard is going to really test your skills. 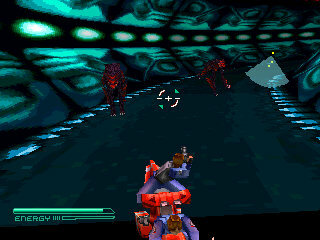 The later bosses on Hard can cause some severe hair loss. Rounding out this surprisingly complete package is a very unconventional 2-player cooperative mode, in which the second player assumes direct control of Gamera, while player one still flies the jet. While this is an interesting addition, it can be a little difficult to get used to, and is overall not as much fun as the single-player mode. 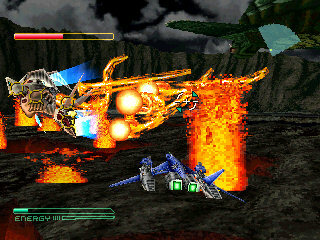 I always like fighting in calderas with blistering hot magma shooting up everywhere around me. On top of all that, the music is quite good, although perhaps not the sort of thing you’d rush out and buy a soundtrack for. It’s solid late-90s electronica, with enough variety to not get annoying after extended play… though it tends to get drowned out in the din of all the explosions and blasting. Still good enough to listen to on its own, though. 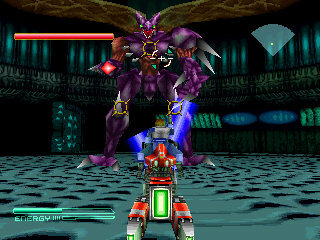 If you can’t get enough of the music, an official soundtrack was released by Zuntata Records and Taito Corp of all companies. Neo Hong Kong is no less garish than the real city. I want one of these bikes. Magnitude 10 A look at all Gamera games, including Gamera 2000.